Google Inc. will hold a press conference in San Francisco on Oct. 4, as the company is expected to officially unveil the second generation of Google Pixel phones by unveiling my Google Pixel 2 and Pixel XL 2. In the past week, Google has made a deal known as the “cooperation agreement” between Google and Taiwanese company HTC, where the company acquired the development team for Google Pixel phones for $ 1.1 billion. As usual before the press conference, we offer you everything we know about the phone Google Pixel 2 and Google Pixel 2XL version of the largest, and all this information is through a set of leaks that have spread during the past few weeks. 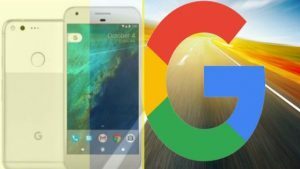 Google is expected to offer Google Pixel and Google Pixel XL2 with OLED screens, where the phone is expected Google Pixel 2 with a screen 4.97 in a resolution of 1920 × 1080 pixels, the larger version Pixel XL 2 will be equipped with the 5.99-inch screen with 1440 x 2560 pixel resolution. As we know, the company “Google” has entered into a deal with LG Korean company to the latter with the supply of OLED screens, estimated at $ 880 million. Most of the reports indicate that the new Google Pixel 2 interface will be a full-screen front-running the front of the two phones, which is the same thing in the phones of the MyMix, the Galaxy S8 and the modern high-end LG phones, This kind of new designs. According to the GFXBench website, Google Pixel 2 and Google Pixel XL 2 will work with a Qualcomm 835 2.4GHz processor, although there are weak and uncertain rumors that Qualicum may be providing Google with a Snapdragon 836 processor that will probably be exclusive to Google phones Pixel 2. In addition, both phones have 4 GB of RAM with 64GB and 128 GB internal storage. Both phones will work with the Adreno 540 graphics processor. Do not forget that both phones are equipped with 3.5 mm speakers. Unfortunately, Google seems to be very uninterested in imaging in its smartphone by leaks. It will provide a 12-megapixel dual-camera rear camera with a 7-megapixel front camera. The rear camera will support 4K video capture, but the rest of the features Google now is unknown to this camera and Google may surprise users by adding some features that may be new to users. As we know that Google has recently launched the operating system Android Oryo formerly known as Android O, Google will rely on the launch of both phones with this new system, knowing that there is a report that both phones have a software code on a special version of the Android system version 3 on Android O Dev Preview 3, and both phones will support the Always On feature. Google Pixel 2 will have a 2700 mAh battery, while the Google Pixel 2 XL will have a 3250 mAh battery, indicating that both phones may support fast charging technology. It is expected that Google will announce the hoover on October 4, and may be available for advance booking later in the same month, noting that the new Google Pixel phones will cost users an increase in prices from previous versions where it is expected to launch phones starting at 849 or 949 dollars For 46 GB and $ 1000 or more for 128 GB and these new prices put these phones together with the high prices of the Galaxy Note 8 and iPhone X.